Today, I spent from 10:00 AM to 2:00 PM, exploring the area south of Kissing Camel Range. I’d estimate that I covered anywhere from 6-8 km during that time frame. There were many interesting areas that I found, such as a couple of caves that a person can walk into. Although I didn’t find any dinosaur bones out there, I did find a lot of petrified wood. During this time, Shannon managed to complete the MDRS user manual that she’s been working on. Between 3:00 PM & 5:00 PM, Shannon and I explored the last of the unchecked roads we still needed to check up on. Tomorrow, Curtis and his team will come and fix the water heater. Shannon and I will clean up the Lab for Crew 184. Ethanol Free Gasoline (5 Gallon containers for ATV) – not known gallons. tomorrow. Also, contractors will be onsite all day tomorrow. Summary of GreenHab operations: Door was opened this afternoon. Summary of ScienceDome operations: Brandon continues his work. Questions, concerns and requests to Mission Support: Nothing tonight, thank you. Today, I set off to explore the area to the South of Kissing Camel Range and West of Cow Dung Rd. First I investigated some of the washes crossing the road to see what I could find. In the first wash that I stopped in, I found pieces of petrified wood amongst other very interesting specimens. I’ll definitely have to explore this drainage basin later. From there, I proceeded further south, until I reached a large wash near White Rock Canyon. I only walked about 2 minutes up, when I found a very large specimen that looked like mineralized bone marrow. Compared to the basalt ejecta littering the wash, this specimen looked completely different. The holes were all aligned in the same direction, and were about the same size. The basalt pieces had gas bubbles, but were of random size, with no obvious pattern. The size of the marrow was very large, with 3-4 mm spacing. If this was indeed a piece of a dinosaur bone, then that meant there is a very large dinosaur fossil somewhere in that drainage basin. I left the specimen where I found it, planning to come back and visit later. After spending over 2 hours in this area, I didn’t find much more, though there is still quite a bit of ground to cover. I returned to the hab by around 2:00 PM, and informed Shannon on what I had found. On our way to town, we investigated the specimen that I had found in the wash. Shannon wasn’t sure what it was, but we confirmed that there weren’t any other rocks in that area that looked like it. She figured that if it was indeed a remnant of a dinosaur bone, that it would have to come from a very large dinosaur, much larger than a Utahraptor or velociraptor. We plan on surveying this area further to see what we can find. Soon after, we ran into town, found a socket wrench kit that would work with the bolts on the new rovers, and organized the next supply of food for Crew 184. We returned to hab after finishing our business in town. Tomorrow and the day after, I will be extensively searching the drainage basin where I found that specimen for large fossil exposures. Since Shannon told me that she hasn’t extensively explored this area, what I may find there could be very interesting. socket set that was the right size! We will get back on it tomorrow. will need to be picked up and taken for disposal. Lucky me! Summary of Hab operations: Three new smoke detectors arrived today. This was the last day for Crew 183. They packed the last of their belongings and headed off, back to Earth. After eating breakfast, Shannon and I started assembling the new rovers. It took over an hour to get just one close to being ready to go, as the rovers didn’t come with assembly instructions. Unfortunately, we don’t have a socket wrench that is compatible with the large bolts used with the rovers. Hopefully we’ll be able to find a socket large enough to work. At around 2:30 PM, we headed off to Cactus Rd, to rediscover a road that was thought to be lost and forgotten to time. Our goal was to see if this area could be accessed and explored by future EVAs. It was obvious it hadn’t been used by ATVs or rovers in years, as the most prominent tracks were from cows. The cow tracks made the road extremely bumpy, slowing our progress significantly. Once we reached the end, we found a wonderful place to access the Summerville Formation, an easy 100 meter walk. There were these red and yellow pieces of chert-like rocks scattered everywhere that could be petrified dinosaur poop. Once we finished here, we made our way to the end of Yellow Zebra road and found an amazing place for future EVAs. This area could easily take several hours to explore adequately. As it got closer to dark, we made our way back to the Hab, and I resumed my soil analysis in the Lab. Tomorrow, we plan to gather food supplies for the next incoming crew. I also intend to start exploring the region south of Kissing Camel range, to see if I find anything interesting. There is also a road in the area we conducted our EVA today that we still need to explore, called Maxwell Montes Rd. We may either do this tomorrow or sometime before Saturday, when Crew 184 arrives. Propane – not known psi. able to go on long ones like Deimos. arrives. Old sketchy ones will be removed. English system. Any information appreciated. 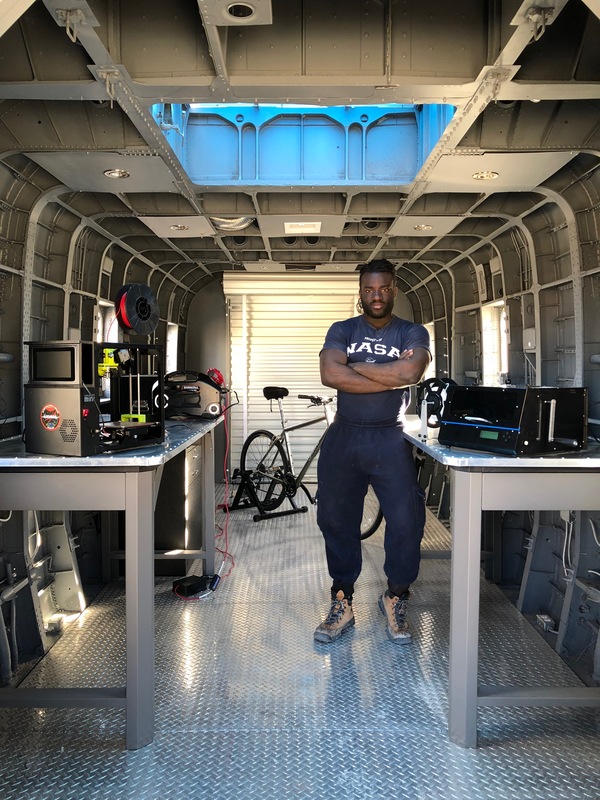 Summary Title: Our final day of rapid prototyping humanitarian supplies at MDRS. Our simulation ended at 0700 MST today. 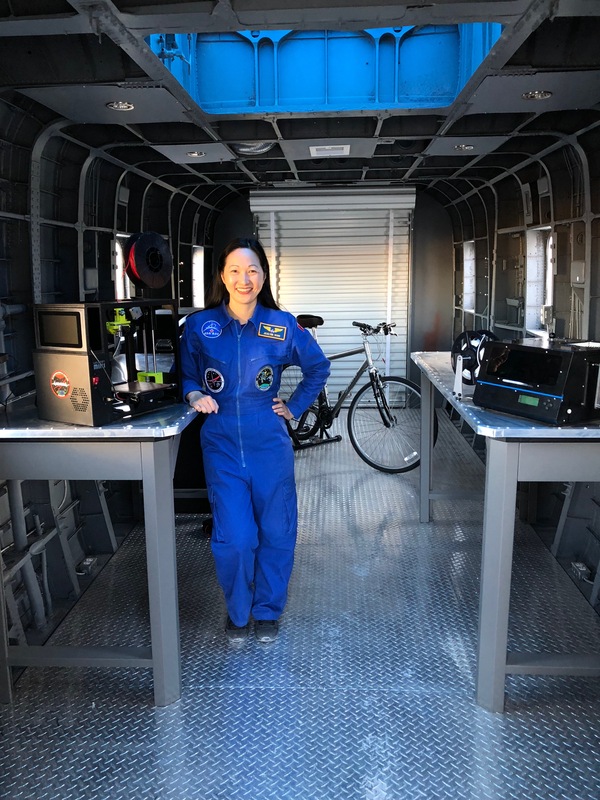 During our mission, we successfully 3D printed designs created remotely by Medical Makers Labeeba Nusrat, Nazanin Soghrati, Sachin Doshi, Shamsa Qaadri, Susan Lee, Winnie Xu, Zak Chaudhary and Ziyuan (Steve) Xu. 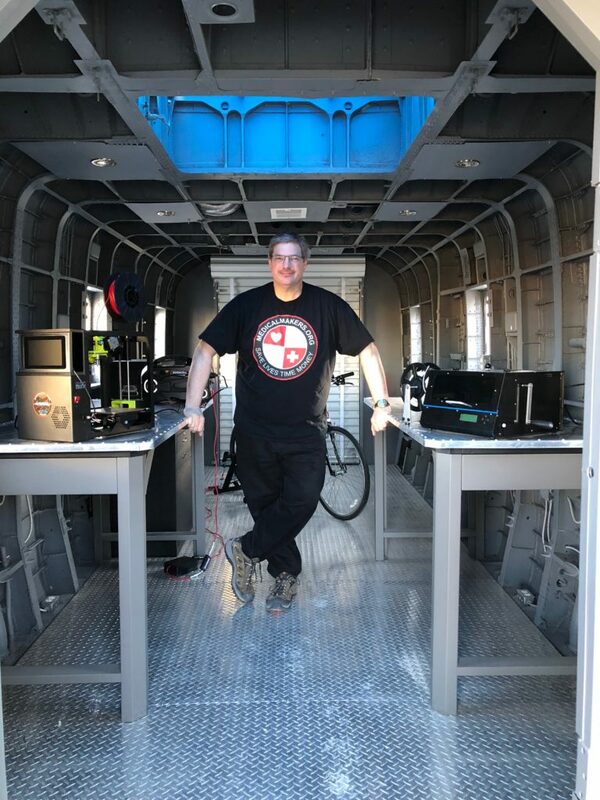 Today Crew 183 continued to rapidly prototype several life-saving and life-changing supplies on-site using our humanitarian 3D printing system (H3DPS-LM). 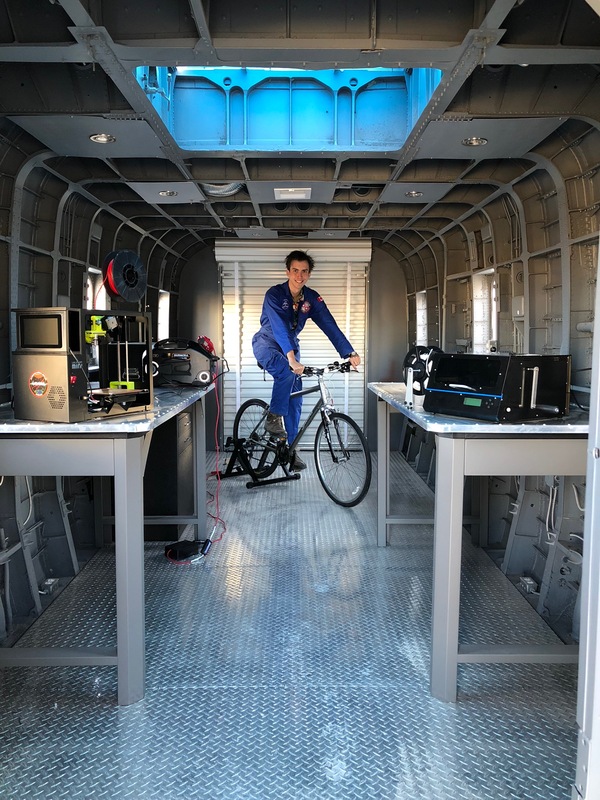 Our crew continued to use our cycling ergometer system to follow the exercise countermeasures schedule for astronauts onboard the ISS and to power our humanitarian 3D printing system. Power generation data was collected non-invasively during training that crew members would have undertaken if no experiment existed. Our meals were prepared by the HSO. 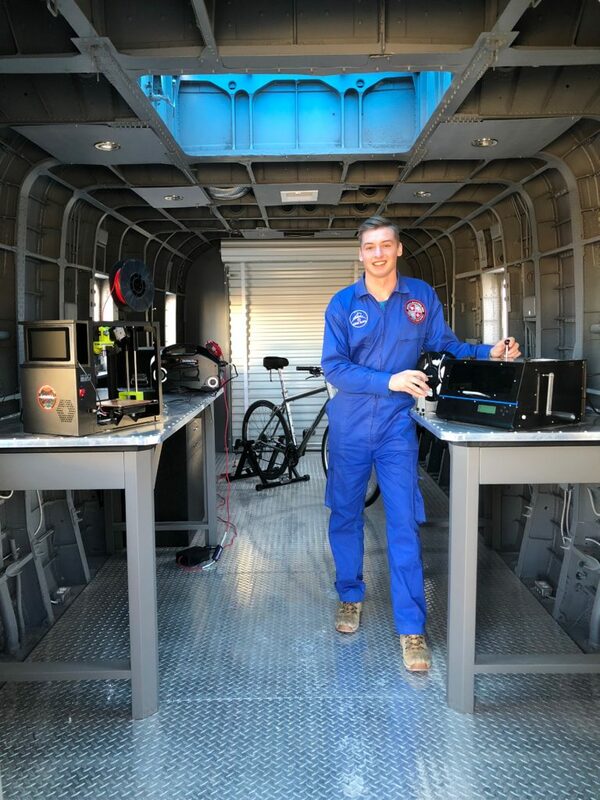 To celebrate the end of our mission, we took photos of Crew 183 and the 3D4MD humanitarian 3D printing, recycling, and cycling ergometer systems inside the RAMM (Repair and Maintenance Module) which is slated for use for engineering research in 2018. We are now packing up our equipment into our Tesla Model S electric vehicle for the return trip home. 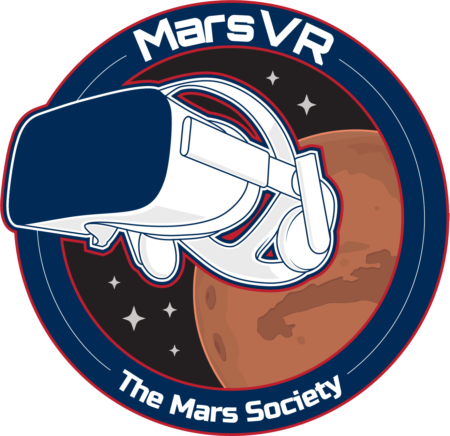 Many thanks to Shannon, CAPCOM and the Mars Society team who made the inaugural Medical Makers MDRS mission possible. We look forward to returning in the next field season. 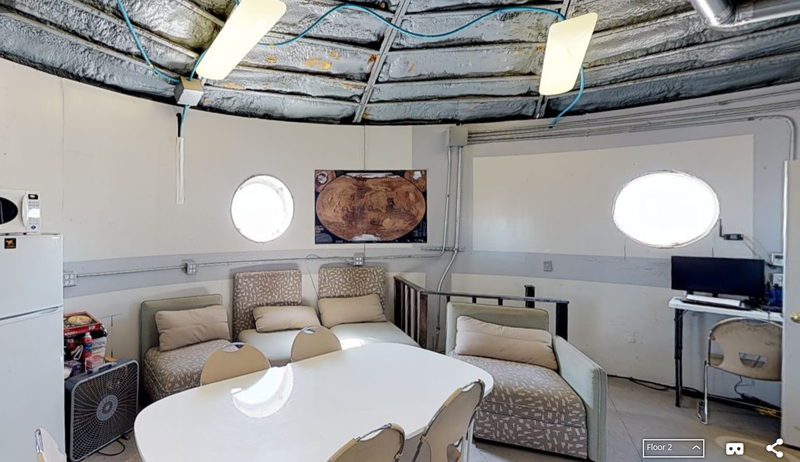 Look Ahead Plan: Preparing to clean the hab and depart MDRS on Sol 6. Anomalies in work: Out of sim. Weather: Sunny with occasional winds. EVA: Crew Astronomer, Crew Engineer, Greenhab Officer, and HSO participated in an EVA led by our Crew Geologist. Today our EVA was conducted out-of-sim, with the purpose of further testing our 3D scanning and imagery technology out on the field. Jordan, Ashton, Toruwa, Dean, and I took Deimos and three ATVs to Lith Canyon. We left the hab at approximately 12:20 PM. On the way, we stopped by the location where we obtained the specimens and return them as we found them before. After spending some time there, we arrived to the Lith Canyon turnout by around 1:15 PM. We walked to the ridge overlooking the canyon and conducted our activities in this area. We stayed here until about 2:30 PM, and made our way back to the Hab by 3:10 PM. Have a good night Mission Support! Changes to crops: Everything is growing well. Daily watering and amount of water used: 2 gallons used at 11:30, 1 gallon used at 16:30. 3 gallons total. Unfortunately my time on Mars is coming to a close, and as such, today was my last full day taking care of the Green Hab. Things have been coming along steadily in the space, and I’m happy to report that all of the plants seem healthier and bigger than when I arrived; as a non-expert gardner, this is the best I could really hope for. Today we went on our final EVA: the sky was cloudy and the winds very strong. 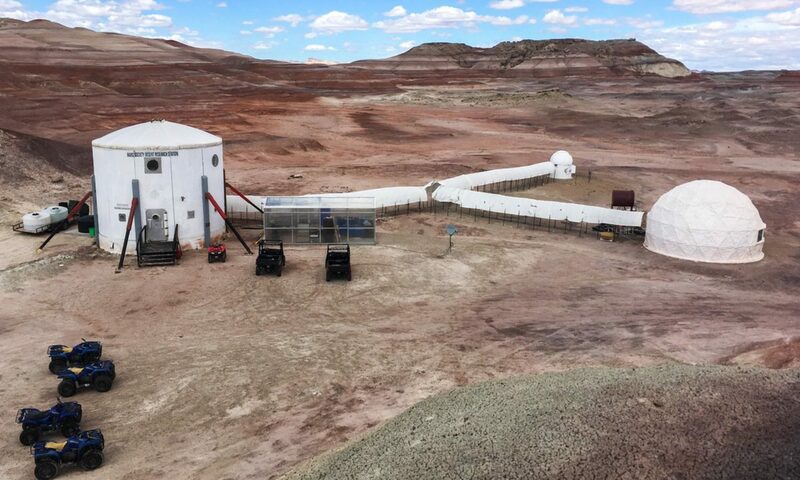 This weather was totally different than the rest of our time here on Mars: on other EVAs, the sun was so strong that we were sweating in spite of the actual outside temperature. Overall, it was wonderful to see the scenery and get some good work done outside the Hab. Lastly, I wanted to emphasize how much I have enjoyed our time here, and how transformative the impact this time has had been on our work and research. I’m amazed by this space and the community that keeps it going, and I can’t say enough how grateful I am for this experience. Let me know if you need any electronics designed or parts 3D printed for the upcoming Aquaponics system in the Green Hab, I could send them out to Mars if it’s feasible. You’re the best, CapCom. Thanks for your hard work.